When preparing your tax returns each year, you have three basic options: do it yourself (manually), use tax software, and employ a tax preparer (e.g., certified public accountant (CPA), enrolled agent, human worker at H&R Block). The least common approach for a grad student or postdoc is to hire a human professional tax preparer, but it is warranted in certain circumstances. 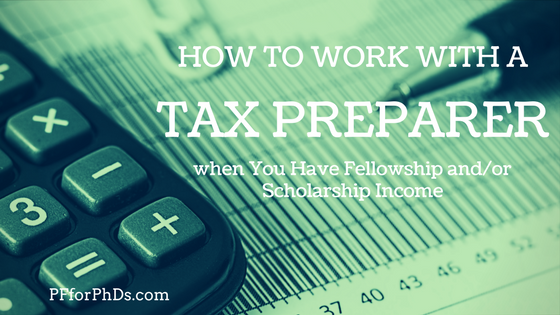 If you do work with a tax preparer, it’s vital to make sure they properly account for the peculiarities of grad student (and sometimes postdoc) income, namely fellowship and scholarship income. Please note that this article is relevant for the 2017 tax year only. With the tax overhaul starting in 2018, fellowship/scholarship income may be calculated slightly differently. I will update this article for tax year 2018 later in the 2018 calendar year. Should I Use a Professional Tax Preparer? My anecdotal observation is that grad students and postdocs most commonly use tax software to prepare their returns. I am actually a proponent of trainees with simple financial lives preparing their tax returns manually as I think there is less room for error and less effort required. It is a good idea for you to consider using a professional tax preparer if you have a complicated financial life, need tax planning advice, and/or don’t want to spend time preparing your return manually or with software. Of course, a professional tax preparer comes with the highest price tag of all of the options, so the cost has to be worthwhile to you. I do not think that a person whose only tax complexity is fellowship or scholarship income needs to use a tax preparer. This person would be better off preparing her return manually or with software. Fellowship and scholarship income at the graduate and postdoc level can appear confusing to tax software or professionals who are unfamiliar with it or only understand it with respect to college students. But in reality, incorporating into your tax return is very straightforward and a professional tax preparer is not necessary. As the recipient of the fellowship or scholarship income, you should know how to calculate and report your taxable fellowship/scholarship income whether you prepare your return manually or not. It is your responsibility to make sure your tax return is correct, and checking the work of the tax software or preparer that you engage goes a long way to ensuring that it is. If you decide to use a professional tax preparer, you should interview the people you are considering hiring. I would not walk into a tax preparation agency and have my tax return prepared by the first available worker. Naturally, you will vet the tax preparer regarding all the financial complexities that caused you to seek her out. Have you ever prepared or do you regularly prepare tax returns for graduate students with scholarship income / graduate students or postdocs receiving fellowships? Are you familiar with how to calculate and report scholarship and fellowship income in excess of qualified education expenses? (If 2 is yes) Will you please briefly explain how you do that? (If 2 is no) Are you willing to learn about this issue prior to working on my return? I add up all the amounts of fellowship and scholarship income. Often these are found on a 1098-T or courtesy letter, but I will also ask you to tell me about income not found there. Then, I determine if it is most advantageous to use your qualified education expenses [grad students only] from your 1098-T to make your scholarship/fellowship income tax-free or if it is better to use the Lifetime Learning Credit or Tuition and Fees Deduction. Your net taxable scholarship and fellowship income goes on the 1040 in the Wages line/Line 7, and if I used the Lifetime Learning Credit or Tuition and Fees Deduction I’ll prepare the appropriate forms. I don’t think you need to eliminate from consideration a tax preparer who is not currently versed in how to handle scholarship/fellowship income, but in that case you need to believe that she is sincere in her promise to learn about it before diving into your return. I do think it’s dealbreaker if she gives a wildly incorrect answer (e.g., “scholarship/fellowship income isn’t taxable”) and expresses no uncertainty or willingness to devote time to understanding the issue when corrected. A special note for those whose fellowship income is reported on a 1099-MISC: While rare, a few universities report fellowship stipends on Form 1099-MISC in Box 3. This can be confusing for tax preparers and software because Form 1099-MISC is more typically used for self-employment income (in Box 7). However, the use of the 1099-MISC does not mean that you as a grad student or postdoc are self-employed. Once you point this out to your tax preparer, he should confirm that he will treat it as scholarship/fellowship income as above. If your tax preparer is not already familiar with how to handle excess fellowship/scholarship income, point her to Publication 970 Chapters 1, 3, and 6 (Chapter 1 being the most salient). A free 60-minute group workshop for US fellowship recipients (graduate students, postdocs, fellows, trainees) in the first two weeks of September 2018. The session will include a presentation, walking through the form together, and an opportunity for questions. It's basically an appointment to pay your estimated tax (with my support)! Come with all your info and leave with this task ACCOMPLISHED! Sign up for the mailing list to receive more details. You should perform a super simple check when your tax preparer sends you your tax return to make sure the reporting of your fellowship/scholarship income went well. Your net scholarship/fellowship income should be added into the rest of your household wage income in Line 7 of your 1040, and “SCH” should be written next to it (possibly with that net scholarship/fellowship amount). I’m actually quite passionate about the issue of the use of professional tax preparers and scholarship/fellowship income. In my position as a personal finance blogger-turned-speaker, I’ve heard at least a dozen personal anecdotes from graduate students who used professional tax preparers or services like H&R Block or VITA and caught major errors in how their scholarship and/or fellowship income was calculated and reported. In many cases, the miscalculated amount of tax due was radically higher (e.g., paying self-employment tax, paying tax on income that should have been made tax-free) or radically lower (e.g., no tax form means no income to report) than the true amount of tax due. These mistakes, frequently caught years later, sometimes cost the student dearly in time and money spent to correct them. I shudder to think of all the mistakes that were not caught by the student, especially regarding overpayment. I don’t share my observations with you to deter you from using a professional tax preparer, but only to caution you that the interview process and double-checking their work is very important. You can’t afford to be ignorant about how scholarship/fellowship income should be calculated and reported, even if you decide to outsource the tax return preparation process.